If you think you're getting more credit card offers in the mail lately, you're probably not imagining things. Credit card companies began stepping up their direct-mail offerings at the end of 2009 after slowing them down for much of the year. During the fourth quarter, 398.5 million credit card offers were sent to U.S. households, a 46-percent increase over the 272.5 million offers sent in the previous quarter, according to Synovate Mail Monitor, a direct-mail tracking service. That's still a far cry from the 668.1 million offers mailed during fourth quarter 2008, but it represents a rebound nonetheless. A combination of a troubled economy and the enacting of new federal regulations on the credit card industry prompted issuers to pull back on their direct-mail marketing efforts, Synovate Mail Monitor says. To comply with the new rules, most of which went into effect in August 2009 and February 2010, credit card companies had to change their business models. Much of the increase in volume stemmed from offers to consumers with low credit scores who make up the subprime credit card market, which saw a dramatic tightening of credit in the previous year. The new stream of credit card offers might be a welcome change if you're in the market for credit, but don't jump at the first offer you get. 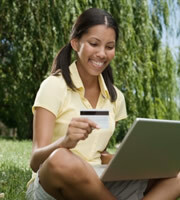 • Compare direct-mail offers with credit card deals online. Consider interest rates, annual fees, rewards and other features. Don't let the chance to earn perks make you overlook the potential cost of credit, and remember if you have less-than-perfect credit, you may not qualify for the best rate offered by the credit card company. • Don't fall for phony credit card offers that ask you to pay a big upfront fee to apply and say you're preapproved for a credit card with no credit check involved. Major credit card companies don't operate this way. Some scams try to get you to pay the fee and then send you a plastic card, good only for buying overpriced merchandise from a catalog. • Shred any credit card offers you don't want before throwing them in the trash. This can prevent thieves from stealing blank applications from your garbage, filling them out, and getting fraudulent credit cards in your name. 0 Responses to "Direct-Mail Credit Card Offers Pick Up"